Raspberry Jam Wattle is a native WA wattle species named after its strong aroma of the cut wood resembling raspberry jam. It’s also known as “jam tree”, “raspberry jam tree” or “fine leaf jam” in English, and Manjart, Munertor, Mungaitch or Mungat in Noongar. This tree had several uses for the Aboriginal people, producing resin and seeds for food, and hardwood for tools and weaponry. 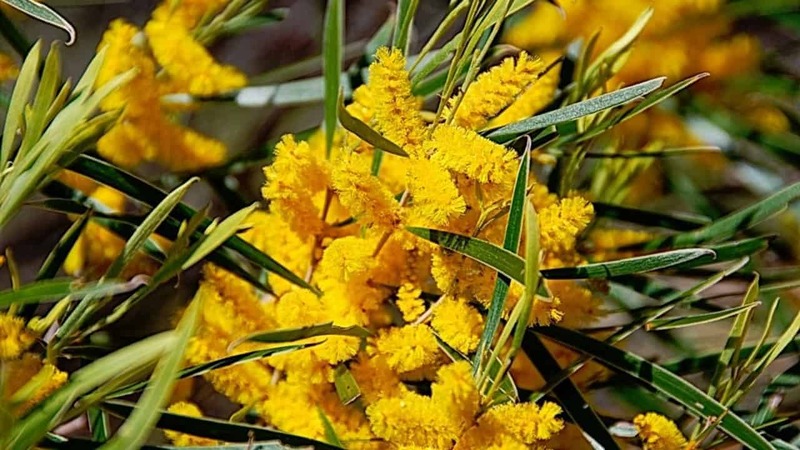 Raspberry Jam Wattle is endemic to Western Australia, found commonly in the southwest and through the Wheatbelt. In Aboriginal cooking, the edible seeds were traditionally ground into flour and coal-baked into small cakes. Seeds are about 5mm in diameter, disc shaped, and grow in long seed pods during the warmer months. The orange-coloured gum (resin) is also edible and can be used to make tea. Because the wood is dense, beautifully grained and termite resistant, it’s highly prized for furniture making, fence posts and a slew of other uses in the home and garden. Raspberry Jam Wattle flowers heavily in Spring, providing an aromatic display of fuzzy golden rods while attracting bees and native birds to the garden. Seed pods follow in the Summer, which can be harvested from the tree or collected off the ground. This is a hardy tree that prefers a freely draining soil. It prefers full sun but will handle part shade, and tolerates drought, salt and frosts. Like nearly all Acacia species, Raspberry Jam Wattle is a nitrogen fixer, effectively ‘sucking’ nitrogen from the air and installing it in the soil around its roots. This provides food for surrounding plants, such as Quandong and Sandalwood, making it an excellent companion or host species. In ideal conditions, Raspberry Jam Wattle can reach up to 10m, but usually grows to around 5m in a suburban garden. It makes an ideal windbreak, privacy screen, fauna attractor, ornamental tree and beekeeper’s delight. Does Raspberry Jam Wattle produce fruit? No, despite the fruity sounding name, the Raspberry Jam Wattle does not produce fruit. In Summer, it produces seed pods bearing small edible seeds. These seeds were traditionally ground into flour for cooking, or used in craft and weaponry. Do I need to fertilise my Raspberry Jam Wattle? You shouldn’t need to fertilise this tree if it’s growing in the ground in a typical garden. However, it may help to sprinkle some organic slow release fertiliser at the start of the flowering season. How often should I prune my Raspberry Jam Wattle? Mature Acacia trees don’t take well to pruning, but a young Raspberry Jam Wattle may need some formative tip pruning to achieve a desired shape. How you prune your tree will depend on the style you want, but we recommend waiting until early to mid-Spring (or whenever the risk of frost in your area has passed).